The images were all taken with an iPhone. Click on any of the thumbnails to obtain a larger version. I met a gal named Jane a few years ago on an internet social network called "Tribe" on their discussion group called "Boston or Bust", for people who were interested in running the Boston Marathon. Her main interest has been triathlon, and thanks partly to her and partly to friends at home, I started doing some short triathlons this year, and had pretty good luck. Here are the race reports for the first two: Wildflower Triathlon and San Jose International Triathlon. Anyway, Jane has done many more than I have, including a few at half-ironman distance. The full Ironman is a race that's the same distance as the original Hawaii Ironman: 2.4 miles of swim, 112 miles on the bike, and then a full 26.2-mile marathon run. A half-ironman is a race with all those distances cut in half. The two triathlons I did were "olympic distance": 1500 meters of swim (a bit less than a mile), 40 kilometers on the bike (about 25 miles), and a 10 kilometer run (about 6.2 miles). This year she decided to do a full ironman and signed up for the Vineman Ironman on August 2 in the area around Santa Rosa, California. She knew I was a good swimmer and a pretty decent cyclist, so she joked, I think, that I should sign up for the Vineman "Aqua-Bike", which is the same as the full ironman except that you don't have to run a marathon at the end. I've run a bunch of marathons (see the race reports), and doing one fresh is a big challenge for me, so at the moment, doing a full ironman triathlon is inconceivable to me, but after a couple of days I did decide to sign up for the aqua-bike. I wasn't worried about the swim at all except that I've had some tendonitis in my right shoulder that gets irritated when I pull hard, but it had been years and years since I rode more than 80 miles on the bike. And even then, the long rides were social rides or organized centuries where there are rest stops to get off and eat. The bike ride in a triathlon is basically an individual time-trial where any time you stop is counted against you and you're not allowed to draft. Drafting is riding so close behind another rider that he or she blocks the wind, and the drafter can use up to 30% less energy. Typically in a group ride or a road race, the lead person trades off all the time, and so you spend most of the ride tucked in behind another rider. The higher the speed or the greater the head wind the more helpful it is to draft. On a group ride the most social part is during long climbs when drafting is not particularly helpful and you're riding side-by-side with your friend. In triathlon, there are very strict rules against drafting, and there are course marshals riding around the course in cars and motorcycles to try to catch violations. Behind every bike, there's a draft zone that's equal to three bicycle lengths. (Normally when I'm drafting I like to have my wheel a foot or less behind the wheel in front of me. The closer you are the better the draft.) At more than three bike lengths, there's not much help, but there's probably a little. If you want to pass somebody, you can do so, but from the instant you enter their draft zone, you've got 15 seconds to get your front wheel ahead of theirs. The instant you manage to do that, they are required to drop back out of your draft zone (again, within 15 seconds) after which they are allowed to try to re-pass you. Anyway, 112 miles of continuous, no-draft riding is not something I'd ever done. The 40k olympic-distance triathlons were the closest thing, but that's only 25 miles, a heck of a lot less than 112. So I was a little freaked out about the distance. I knew that if I took it easy I could finish, but I wanted to get a good result, and try to push hard through the whole ride. I did have the "good luck" to talk to a couple of very good bicycle road racers at a party about a week before the event, and I told them that I was a bit freaked out and wondered if they had any advice. Here's the advice I got: "There will probably be cameras on the course. Don't vomit in front of the cameras!" And that was the best advice I got. OK, that's not true -- I did get some actual good advice from my coach, Lisa. The plan was to mentally split the course into three thirds: the first 40 miles, the second 40, and the third 32. I'd use the first 40 to "warm up", not going slowly, but recovering from the swim and getting my legs warmed up. (I don't kick at all in a long swim, and wearing a wet suit that's no problem, since that buoys up my legs so they're parallel to the water surface.) Then for the second 40 I was to push pretty hard, and for the end of the ride I'd do "intervals": two or three miles hard and one easy, over and over. It's best not to think of the whole distance at once, since as you take off, 112 miles is pretty daunting. For a short race you don't need to worry too much about hydration or fuel, but you've got to take on calories and water in a long race. Lisa and I decided that a good target time for the bike would be six hours. 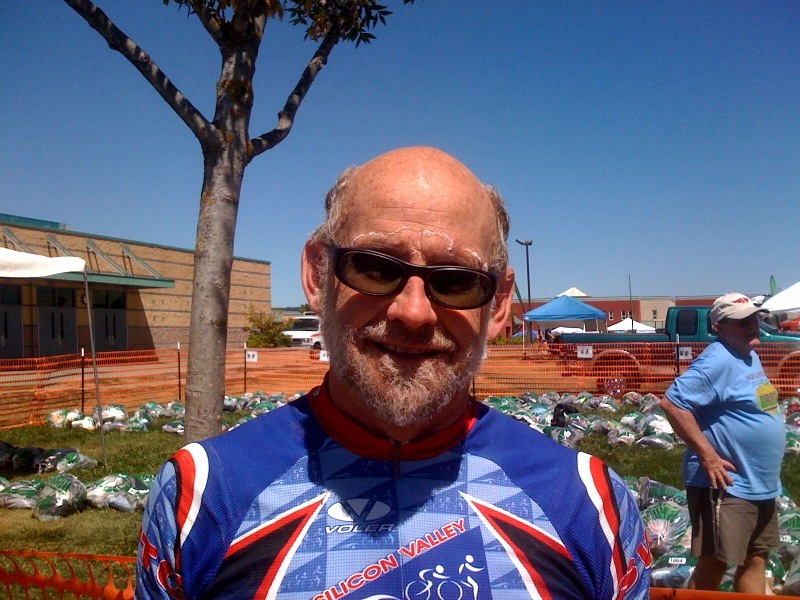 I thought I might be able to do it, although the fastest century (100 miles) I'd ever ridden in my life (and that was many years ago) was well over 6 hours, and that was with drafting, but with rest stops, too. And this was 112 miles. As currently set up, my bike has one fixed aerodynamic water bottle in front of my face with a straw sticking out. It's supposedly refillable, but it either leaks like crazy or if I fix the leak, I can't refill it on the go. It's so annoying to be splashed by leaking water that I've rigged it not to leak. I also have one water-bottle cage on the down tube. There's none on the seat tube or it would completely foul up the aerodynamics. Most of the riders had special cages that hold one or two bottles behind their seats, and I thought about getting one, but didn't get around to it until too late and I didn't want to try a brand-new setup on race day. Now that the race is over, I think I will get one to use on longer races, and maybe I'll take off the front-mounted aero bottle. Two bottles is plenty for the whole of a 40k olympic-distance race. This was the nineteenth edition of Vineman, and they've got things down pretty well. The aid stations were arranged so that 30 or 40 yards before the station there was a fenced in target area where you could toss your empty bottle(s) so your cage(s) would be ready to receive new ones. Then there were perhaps 10 volunteers holding out bottles. You'd yell for what you wanted, grab it on the fly (probably at 10-15 mph) and stuff it in your cage. There were also folks handing out various sorts of food: energy bars, bananas, and I even picked up a peanut-butter and jelly sandwich about 3/4 of the way through the race and that really hit the spot! My plan was to eat about one gel pack per 10 miles and to supplement those calories with Gatorade. I wound up only eating half the packs I carried, since I picked up food from the aid stations when I could. (It was easier to grab the food, already open, from the volunteers than to reach behind my back to fish around in my jersey pockets for what I wanted.) I thought I'd just take Gatorade at all the stations, but toward the end it was pretty hot, and I wound up basically alternating: Gatorade at one and water at the next. The bottles, of course, fit perfectly into the cages. In hot weather I've had some muscle-cramping problems, especially on long runs, but recently during a very hot day and a 75-mile ride I started getting quad-cramps in spite of the fact that my riding partner and I were as well-hydrated as we could be. He was also complaining of the same thing, and it had never happened to him before, either. So Lisa and I decided that I should also carry "Endurolytes": small capsules of electrolytes that I'd take on the bike. I didn't have a good way to carry them, and I just stuffed five capsules into a small plastic bag. I sweat like a pig when I ride, so I had to put the gelatin capsules in something. It was a bit of a pain to get them out -- I basically just chewed them out of the bag -- but it worked. What I did to prepare electrolytically was that for a few days before the race I ate about three of the capsules each day. I had another two the night before and three in the morning when I got up. Then, just before the race I ate two, and ate five more during the race: two at about 30 miles and the last three at about 65 miles. I've seen a device called a "Salt Stick" that attaches to your handlebars and is sort of like a Pez dispenser that delivers a capsule at a time, and that might be a good idea, depending on how much handlebar real-estate it takes up. One problem with triathlon bikes is that the real-estate on your handlebars is pretty limited. There are the aero-extensions and elbow pads and if you stick a water bottle between the aero-extensions, there's barely room for a computer. All I carry is the computer and aero bottle. I've got a small pack behind the seat for spare tube, tools, et cetera, and that's it. My bike doesn't even have a place for a pump, so I carry a small carbon-dioxide inflator and a couple of CO2 cartridges in case I get a flat. In retrospect, I got enough calories during the ride. I was pretty hungry at the end, of course, but I don't think I could have digested any more than what I took on. When you're working hard, your stomach is less efficient, and although you may be burning 600 calories per hour, you can only take in about 200 or maybe 300. But I'll never forget that peanut butter and jelly sandwich which was great! After the ride and on the drive home I more than made up for the calorie deficit, of course. My wife Ellyn and I started driving up at about 11:00 am the day before the race and we had lunch (a giant hamburger for me) in Windsor: the town where the race ended. Then we drove over to the race headquarters (in Windsor at the local high school) to pick up the race numbers, timing chip, and all the other crap you get at these events. Eventually we hooked up with Jane (It was great to meet her, finally.) and Jane and I went in to the high-school auditorium for pre-race instructions. There were so many athletes that we filled the auditorium to standing room only, and all non-racers including Ellyn had to stay outside, so she treated herself to a massage at the sports expo. At the expo and headquarters there were a couple of "color" guys doing random announcements over a loudspeaker. They'd try to guess your finishing time by looking at you, for example. But when they weren't doing that, they were just providing a pretty hilarious steam-of-consciousness back-and-forth. We learned a couple of terms I'd never heard before. When you crash, you wear a helmet since you don't want to "crack the pumpkin", and if you're a guy and get passed by a gal, you've been "chicked". It's obvious when I think about it, but the USAT representative had some good drafting advice, and that is to use the 15 seconds in the draft as completely as possible. In the past, when I wanted to pass someone, I'd pull to the side before I entered the 3-bike-length zone and pass them that way. On this race I just rode right up their butts, sat in full-draft protection for a few seconds, and then pulled over to the left to pass. And then, of course, I did a short sprint to try to get them out of my draft as fast as possible. The bike ride ends, as I said, at Windsor High School at which point my race is over, but from which the poor full-ironman folks then had to begin running a marathon. The marathon course, to my mind is especially psychologically brutal: you run out and back over a 4.5-mile road three times. That means you come basically to the finish line two times when you have to turn away and continue. The weather was also sweltering the day before the race and it was expected to be hot on race day, too. Every marathon I've run (except for Boston) has started at the crack of dawn so heat is unlikely to be a problem. At Vineman, heat was surely going to be a problem. We got to the restaurant at 7:00, Jane wasn't there yet, and I wasn't sure under what name the reservation was made (there were no "Jane"s on the list). There was a reservation for a huge group of 15, and one for a group of 5. We decided it was probably the group of 5 by someone named "Tina", but we just decided to wait outside. The other problem was that the name of the restaurant was "Lo Coco's", and there is another restaurant in Santa Rosa called simply "Coco's". Jane had emphasized the "Lo", so we were pretty sure we were at the right place, but then Tina arrived with the other four people, so clearly it wasn't Tina. We were about to leave and try the other "Coco's" when somebody standing in front of the restaurant happened to mention the name "Jane", and sure enough, it was the correct Jane. We were in a group of 15. Jane's kids arrived (which was a total surprise to her -- one of her friends had arranged to get them to California to meet her for the race) and the the kids held up amazingly well, for it being way after their bedtime. I was much more cranky and it was way past my bedtime, too. They're great kids. I spent most of the time talking to a guy across the table who was from Arizona, and he was a little full of himself, always having a better story than whatever he heard. 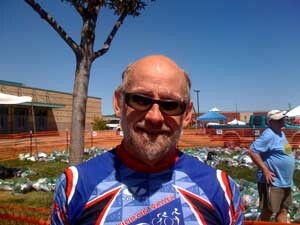 He was particularly down on "roadies": people who ride road bikes and constantly talked about what weak riders they are. I think his "roadies" were just "civilians" who ride in organized centuries: the "roadies" I ride with are top-quality riders, most of whom I would trust far more than the average triathlete in riding in close formation. They're much more predictable, and on average, better bike handlers. Triathletes have to ride alone in the races, so they get a lot less practice in close quarters so they tend to be more squirrely on the bikes, and the tri bikes themselves are less stable and hard to control. A good road bike is like a Porsche and a good tri bike is like a drag racer. Since you're hardly ever close to anyone, there's not the need for good handling characteristics. Anyway, we got to bed at about 10:30 or so, and I was up at about 4:45. I had some bran-muffins the night before to make sure I "flushed the system" in the morning, and in the morning I had one more muffin plus a couple of hard-boiled eggs. It turns out that I forgot to bring salt to make the eggs palatable so I just opened an Endurolyte capsule and sprinkled the eggs with "electrolytes". It worked fine: not exactly like table salt, but close enough. 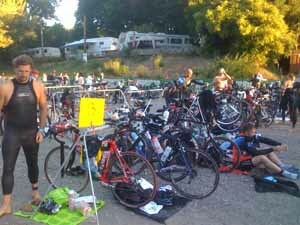 We drove to the start: a beach on the Russian River in Guerneville, and I set up the bike in the transition area. At this time of year, the river is flowing very slowly, and the course goes upstream for .6 miles, turns around and goes back down. Some people were doing a "half aqua-bike", and for them, that would be the end. The rest of us repeated the up and back. Since it's in a river, it's pretty hard to get lost. I only had to look up occasionally to figure out where the next buoy was. The water was pretty warm but thankfully, cold enough that it was legal to wear a wet suit. (If the water temperature is over 78 degrees, you can't wear one, according to USAT rules.) You can swim faster in a wet suit, and I don't like being cold. During the meeting the day before the USAT representative told us that she didn't know whether wet suits would be legal: that we'd find out on race day. That made me think that the river temperature was close to 78 degrees but in fact, on race morning it was 73 degrees: not close at all. 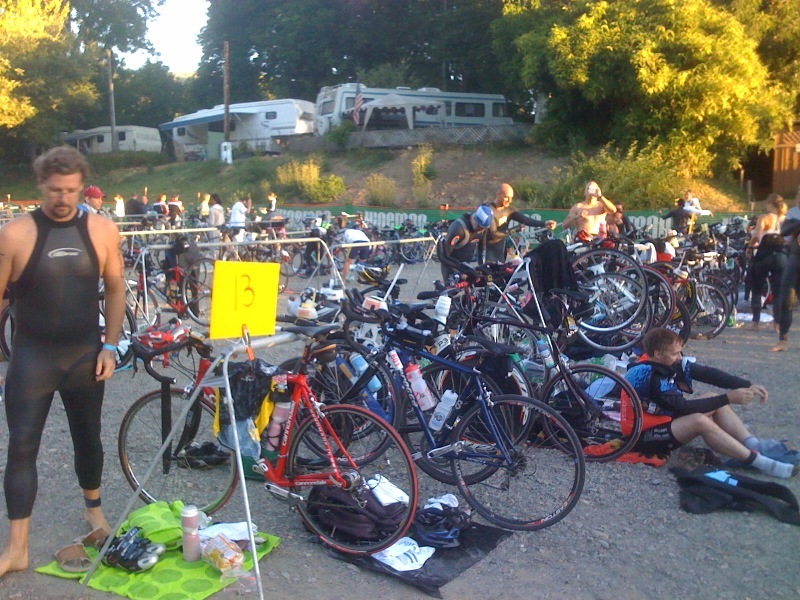 The image is of the transition area. I was a little worried that I hadn't had any coffee on race morning, since I usually drink a couple of cups in the mornings. At the swim start they said they had coffee, so I sent Ellyn over to buy a cup while I set up my bike transition area. Unfortunately, they were late in starting to brew the coffee (it was done by high-school kids who perhaps had never made coffee before), but she finally got a cup shortly before my swim started, so I did get down about a half cup just before the race. I didn't have any headache "withdrawal" problems, so I guess that was enough. 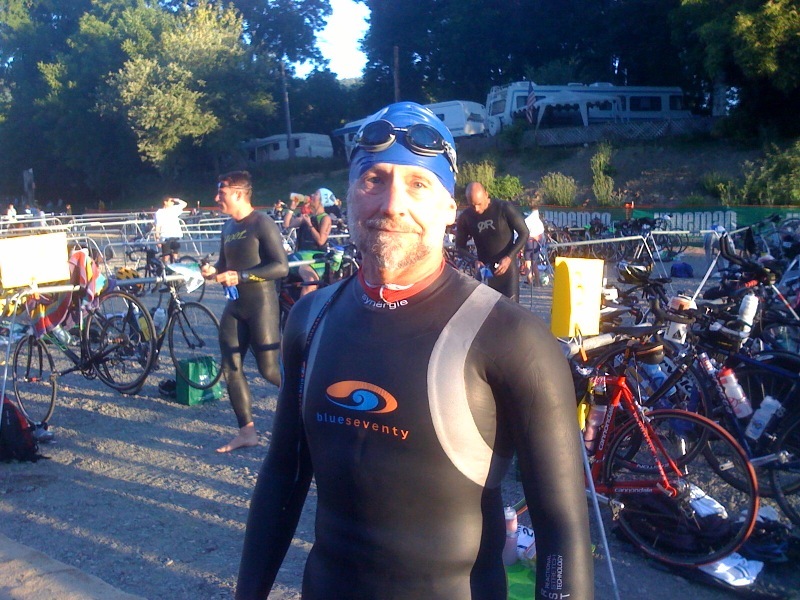 Other than Jane, whom I'd just met, there was only one other competitor I knew at the race: Randy, the guy who coaches the open-water swimming for my triathlon club (Silicon Valley Triathlon Club: SVTC). I met him for the first time for a couple of minutes at the Wildflower triathlon where he suggested that I join him for some open-water swimming practice. (I "got lost" in the swim at Wildflower and wound up doing some "extra credit" swimming to get back on course.) I actually solved the problem mostly by getting prescription goggles so I could actually see the course buoys, but I did join Randy and a bunch of other SVTCers for a swim in Santa Cruz a few weeks ago. After the swim we did an hour run and Randy's pace was pretty close to mine so we yakked for an hour or so on the run where I learned that he was going to do the full Vineman triathlon: his first full ironman. There were four waves of swimmers: full-ironman men under 40, men over 40, all the women, and at the end, the aqua-bikers and the members of the relay teams. We started at 5-minute intervals from 6:45 for the youngest men to 7:00 for me. I like starting last since it gives me a lot of people ahead to catch, and since your time is measured by an RFID chip, you can compare your final time to everyone else's. The members of each wave had different-colored swim caps and the nice thing about that is that even in the water you could pass folks with different-colored hats and know you were making good time. I'm a fast swimmer, so I always do well on that leg. When you hit the first yellow hats (the women), you know you're 5 minutes ahead of them. Later, you start passing the older men, and even a few of the younger men on whom you've gained 15 minutes, just in the water. The image is of me, ready to go. Actually, there were a couple more waves, but they started at 8:00 or so. At the same time as the full Vineman events were going they were running a half-ironman "Barb's Race" for women only to benefit cancer research, and they were also running a half aqua-bike at the same time. These were timed so as to provide minimal interference with the full events. In fact, the only people I saw from those events were ones who were very slow. I was on my second big loop of the bike course when I passed them, so I had probably effectively gained two hours on them on the bike. And of course there were a bunch of them at the finish line or out on the running course when I finished. The start was in the water and as usual it was a bit rough, but only for a couple of hundred yards before the swimmers got spread out and it got easy. Because of the relay swimmers I was not in the lead, and in fact, I don't know exactly how well I did, since, as I type this, the results aren't yet posted. I'll append the results to the end of this article when they become available. I've never done a swimming race of any sort for a full 2.4 miles (and hadn't even done any workouts of that length) but I wasn't really worried. I swam at a very solid pace and don't think I changed speed much for the entire race and as I was coming to the beach for the finish, I didn't feel particularly tired, although I was mentally tired of swimming. I must have been, however, since when I tried to stand up at the end, I had a hard time with balance for a second, and could only walk up the ramp to the bicycles rather than jog. I only had one bad thing happen during the swim. About half-way back on the fourth leg, a gal suddenly stopped cold in front of me and I hit something hard with my head (maybe her head?). I was actually "seeing stars" -- little bright dots in my visual field -- for about a minute after that. I hope I didn't hurt her. I'm pretty sure the collision was at least mostly her fault, however, since she said, "Oh my God, I'm so sorry!" As I said above, I don't know the official split times yet, but I'd guess I spent about 5 minutes in transition. In a long race, transition times are less crucial, and you're setting out for 112 miles, so you want to make sure everything is right. I pulled off the wet suit, stuffed my pockets with gels and the electrolyte capsules, took a drink of sugar water, washed the sand off my feet by squirting them with fresh water, put on socks, biking shoes, sunglasses and helmet, and finally, stuffed all my belongings into a bag with my race number on it that would be delivered to the finish area. I started the bike computer and then I jogged out of the transition area with the bike and hopped on right after the "mount" line. Within about a mile I realized that something was wrong. I had been hearing this weird beeping and I finally realized that it was my bike computer that was doing it. It's a really complicated computer and does far more than I want, but if you want the ability to measure pedaling cadence (which I did) you need to get a computer with way too many other features. Somehow I had bumped a button or button combination that had turned on beeping when something happened. I don't even know yet what the "something" is. When I can stand to look at the bike again I'll try to figure it out. Sometimes you can make settings to have an alarm (the beeping) go on when your cadence is out of some range, or your speed is out of some range or something. It seemed to stop beeping when I went at certain speeds, but I never could figure it out. After about ten minutes with the constant beeping, I thought I'd go insane if I had to listen to it for 112 miles, so, after trying to push various random buttons to turn it off (I have no idea exactly how it works: I just usually use the default settings), I decided that I'd just hit the "reset" button and maybe lose the computer information altogether. Well, the reset button is under the computer, and with a lack of real-estate on the handlebars, I had crammed on so much stuff that I couldn't reach the reset button with my fingers. So I endured the intermittent beeping (although it was usually on) throughout the entire ride. In retrospect, I'm glad I didn't lose the computer's distance measurement, since it was good to know exactly when the aid stations were coming. When I knew that one was due in a couple of miles I'd be sure to drink the rest of whatever was in my bottle so I could get every possible drop of liquid. As I said above, I wish I'd had room for one more bottle, but I was able to get almost as much fluid as I wanted by completely emptying each bottle before picking up a new one. I started with two full bottles, and picked up a new one at each of the seven aid stations. I was completely out at the end, so I had nine 23-ounce bottles of liquid during the bike race and I sweated it all out: I never had to pee on the course, and was a little thirsty at the end. At about 40 miles into the bike portion I caught up with Randy who was (very sensibly) riding conservatively since he knew he was facing a marathon at the end and had never done one before. My riding was the exact opposite, since I didn't have to save anything. Anyway, he seemed to be doing well, so we talked for 14 seconds before I went on (so as to avoid a drafting penalty) and I didn't see him again. I never did see Jane except at the start before the swim. I know I'm a lot faster in the water than she is and I'm sure I got out on the bike well before she did. I passed her in the water, and it's really hard to tell who's who in wet suit, cap and goggles. I felt great for the first 60 miles or so on the bike. I noticed at the half-way point that I got there in 2:53, so I had seven minutes to "play with" if I was aiming for a six-hour total bike leg. Almost all the riders were very friendly, and we'd usually exchange encouraging words during a pass, whether we were passing or being passed. I got passed a fair number of times early on since the swim is the weakest leg for most triathletes and it's my strongest, so I got on the bike ahead of a lot of young, strong cyclists who had no problems putting me away on the bike course. A nice thing about triathlons is that everybody has their age written on their calf with a felt-tip marker so you know if you need to worry about that person in the age-group competition. Normally the groups are five-year ranges. I'm 59, so I normally race against men between 55 and 59. With the smaller field for the aqua-bike, there was a 10-year range, so I was racing against the 50-year-old speed demons. Next year I'll be 60, so I'll only need to race against geezers. At about mile 50, the most annoying thing happened. I passed a young guy and when I did, he hopped right on my wheel, drafting illegally. I kept looking back, and he was always there. We had a nasty head-wind at the time, so it was a huge advantage for him. I knew he wasn't real competition since he was too young, but it was still annoying. I had fantasies of tapping my brakes so we'd "touch wheels" which is normally catastrophic, but only for the guy behind, but I was able (barely) to keep my temper. He stayed locked on for two or three miles, after which he was completely rested and he shot ahead. During the whole time I kept praying that a course marshal would happen by and give him a two-minute time penalty, but no such luck. I noted his race number as he re-passed me, however, so I could look him up at the end. Other than him, however, everybody else on the course was great! There was one poor guy who was obviously a very strong rider on a completely tricked-out bike with a full disk rear wheel who was having terrible mechanical problems. I passed him by the side of the road, working on his bike, and shortly afterwards, he passed me, but the bike was making terrible, terrible noises. This happened three or four times. I finally passed him toward the end, so I'm sure he finished the bike part, but if he was in serious competition for a prize (and it looked like he might have been) he was done-in by his bike. Speaking of that, there seemed to be an inordinate number of folks on the side of the road fixing flat tires. It was sort of surprising, since to my mind the road surface was in very good shape. I have a theory, of course. Many triathletes are so obsessed with speed that they don't take time to dodge minor road irregularities. I've ridden road bikes forever, and I dodge almost everything. Usually nothing bad happens if you hit a solid bump or don't dodge some shards of broken glass, but eventually, it catches up with you. I had no problems with "mechanicals" on my bike (other than the beeping computer that threatened to drive me insane). Well, I guess there was one other: I rolled across a piece of duct-tape that stuck to my front tire and made a horrible noise each time it passed through the brake calipers. I had to stop and take it out, and that must have cost me 5 seconds. It was actually pretty worrying when it occurred, however, since it just happened that I hit the tape at the exact moment I had shifted gears so the instant after the shift, there was a horrible, unknown noise which was a little unnerving. The other thing I enjoyed was the fact that during the ride I ran every stop sign and every red light, and the best part was that there were cops at each one who watched me do it, and stopped the cars who might have gotten in my way. Also, throughout the course there were groups of spectators watching the race and cheering for absolutely everyone. It made you pick up the pace each time you passed. I said "Thank you!" to all of the cops and to most of the spectators. At about mile 65 I started getting tired and sore and my legs started threatening to cramp. They were weird muscles: the adductor leg muscles, for example, and my hands. I ate all the rest of my electrolyte tablets at that point and made it a point to be sure to drink as much as possible, but the problems remained for the last 50 miles or so, and it did slow me down. I found getting into the aero position was more and more uncomfortable, so I rode in normal position more than I wanted to, but I did force myself into aero position over and over since I knew it was faster. I was passing more and more people toward the end, so that was a psychological help (although deep down I knew most of them were facing a marathon and I wasn't, so it wasn't really "fair" to take pleasure in passing them). I normally climb out of the saddle, but the cramps came back when I was out of the saddle, so I had to climb the nasty hill at 100 miles sitting down. That was painful for me! About five miles from the finish, I caught up to the guy who had drafted me earlier in the race (I knew it was him since I had memorized his race number) and this time as I passed him, I noticed he was wearing an Arizona triathlon club outfit. I did a double-take and looked at his face, and it was the guy who had been sitting across from me at dinner! I passed him for good there and rode on to the finish. I secretly consider myself to be more of a "roadie" than a triathlon guy, but unfortunately, I was on the tri bike, so he didn't know that he had really been passed by an old geezer roadie. I'm pleased with my time, however. I don't know the official splits yet, but my overall time was 7:10 and change. My bike computer registered 6:03 and I think the transition was about 5 minutes. That means about an hour in the water. On the other hand, I started the bike computer in the transition area, so maybe it'll be a tad less than 6:03, but I doubt I broke 6 hours. I did note that when the computer rolled over to 100 miles, my time was 5:23 which is my fastest "century" ever, and that with no drafting. It was pretty flat, though: only one steep hill (which came at about miles 50 and 102 on the big loop) and that's why the final 12 miles were sort of slow. I did the second climb in the saddle which was pretty inefficient for me, but the only way I could do it without cramping. I don't think I would have done anything much different if I had to do it again, except maybe do a few more long-distance rides in preparation (not necessarily fast, but just to get used to being out so long so I'd have less problems with a sore back, et cetera) and spend more time in aero position. I think I took second place in my division; at least according to the preliminary results posted at the event. We came home rather than wait overnight for the awards ceremony. I'll know for sure when the complete results are available. The winner was way faster than I was. He beat me by a half-hour. I'm hoping he was a 50-year-old! At least I broke 7:11! Here are the splits for the men in my age group or older who beat me. It's clear that I need to work very hard on my cycling! Since my time at the half (56 miles) was 2:53, even if I'd been able to keep that up, I'd have had a 5:46 which would not have been near enough.